PAYMENT FOR CLASS MUST BE RECEIVED IN ADVANCE IN ORDER TO SECURE YOUR SEAT. NO CASH OR CHECK PAYMENTS WILL BE ACCEPTED. You can make payment and receive the discount by using the forms provided below. Call us at (800) 728-0209 or meet us in Live Chat if you have any questions. 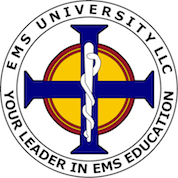 Copyright © Emergency Medical Services University, LLC 2003. All Rights Reserved.